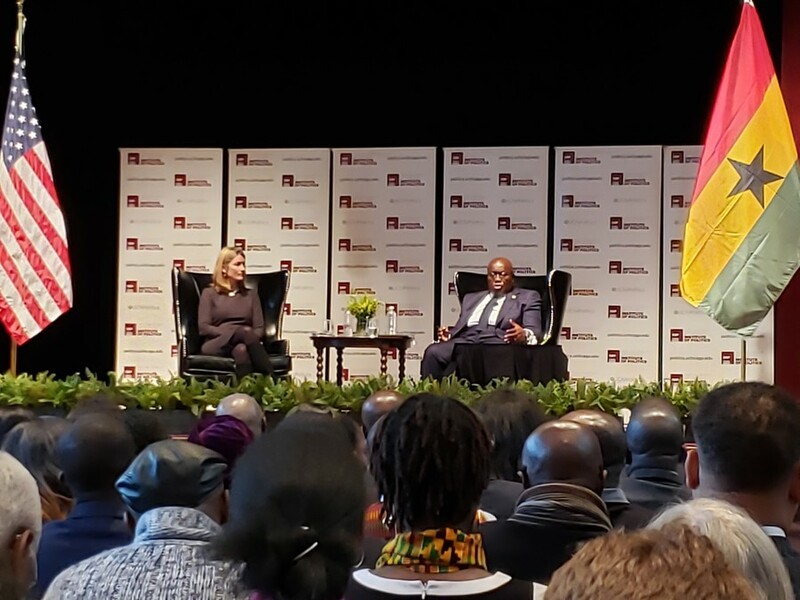 Ghana President Nana Akufo-Addo answering questions from attendees, sitting alongside IOP executive director Gretchen Crosby-Sims. Akufo-Addo addressed his policies and initiatives as president, which he said were in response to years of poor governance. He mounted unsuccessful presidential bids in 2008 and 2012 before winning the presidency in 2016. “Upon becoming president in January 2017…I put before the Ghanaian people an ambitious program of socio- [sic] and economic transformation, hinged on restructuring the institution of our governance, modernizing our agriculture to enhance our productivity, expanding rapidly our industrial sector, and rationalizing our industrial sector,” he said. During the Q&A after the talk, which included both those affiliated and unaffiliated with the University, one attendee, Samya Amu, asked the president how Ghanaian Americans living in the U.S. should respond to the visa restrictions and sanctions the government placed upon Ghanaian nationals in February, claiming that Ghana was not properly accepting deported Ghanaian nationals. Akufo-Addo said that the Ghanaian foreign minister would meet with representatives of the United States to debate those issues. “We think that the American administration got the wrong end of the stick, and we have spent the last couple of months trying to explain [to] them exactly what the realities are,” Akufo-Addo said. He said that he hoped the meeting would improve the visa situation. According to figures from the United States Agency for International Development, the United States’ aid to Ghana totaled around $184 million in 2017. He also praised the Trump Administration’s implementation of the BUILD Act last October, which overhauled how the U.S. government lends development funding to foreign countries, including Ghana. “I will continue to urge the current leadership of this great nation, proclaimed as the land of the free and the home of the brave, not to ignore Africa,” he said. He also addressed several controversies in Ghanaian politics, such as Chinese state-owned company Sinohydro’s recent investment in Ghanaian development, which some have cited as evidence of a Chinese colonization effort. In this case, Akufo-Addo believes history has taught its lessons. “We are all much wiser about these things [now], and we are going to go into these new relations with our eyes wide open. Nobody is coming pretending to be bringing God’s word in one hand and taking our lands and resources with the other,” Akufo-Addo said. First-year Eseme Segbefia asked Akufo-Addo to clarify what it would mean for Ghana to go into the deal with China with “eyes wide open,” and what steps the country would take to make sure Ghanaians themselves benefit from the deals. Akufo-Addo said that the Sinohydro Corporation deal would help Ghana develop its roads and railways, and that Ghana would pay China back through trade. “As far as I'm concerned, it’s a good deal for Ghana; it’s a deal that allows us to deal with critical deficits in our economic architecture, and does so on terms that are not onerous to us,” he said. He also emphasized how Ghanaian contractors working on the developments will have access to the money from the Chinese corporation and will be able to develop their own capabilities further. During his remarks, he praised other recent investments by major international corporations, including Google’s plan to build in Ghana its first artificial intelligence research center in Africa. Akufo-Addo’s father Edward, who would eventually serve as chief justice and president, was a leader of the United Gold Coast Convention, a political party formed in 1947 to advocate for independence from colonial rule, and his house served as a headquarters for the party. Witnessing the activities of the party first inspired Akufo-Addo to become a politician at a young age.